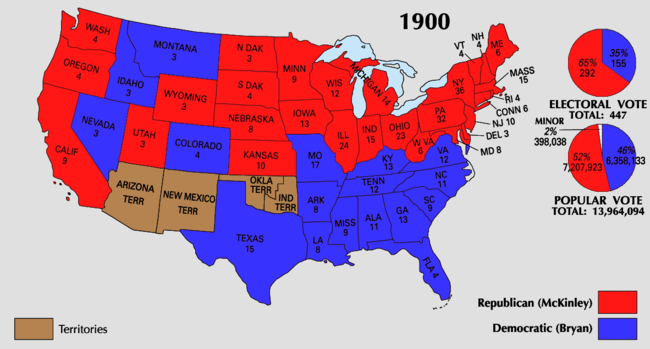 For related races, see 1900 United States elections. Presidential election results map. Red denotes those won by McKinley/Roosevelt, blue denotes states won by Bryan/Stevenson. Numbers indicate the number of electoral votes allotted to each state. McKinley and Bryan each faced little opposition within their own party. Although some Gold Democrats explored the possibility of a campaign by Admiral George Dewey, Bryan was easily re-nominated at the 1900 Democratic National Convention after Dewey withdrew from the race. McKinley was unanimously re-nominated at the 1900 Republican National Convention. As Vice President Garret Hobart had died in 1899, the Republican convention chose New York Governor Theodore Roosevelt as McKinley's running mate. 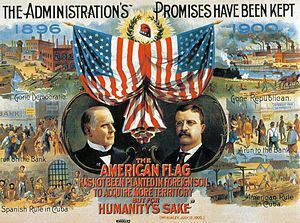 The return of economic prosperity and recent victory in the Spanish–American War helped McKinley to score a decisive victory, while Bryan's anti-imperialist stance and continued support for bimetallism attracted only limited support. McKinley carried most states outside of the Solid South and won 51.6% of the popular vote. 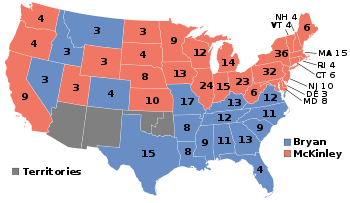 The election results were similar to those of 1896, though McKinley picked up several Western states and Bryan picked up Kentucky. McKinley was assassinated in September 1901 and was succeeded by Roosevelt. The 926 delegates to the Republican convention, which met in Philadelphia on June 19–21, re-nominated William McKinley by acclamation. Thomas C. Platt, the "boss" of the New York State Republican Party, did not like Theodore Roosevelt, New York's popular governor, even though he was a fellow Republican. 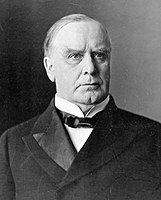 Roosevelt's efforts to reform New York politics – including Republican politics – led Platt and other state Republican leaders to pressure President McKinley to accept Roosevelt as his new vice- presidential candidate, thus filling the spot left open when Vice President Garret Hobart died in 1899. By electing Roosevelt vice president, Platt would remove Roosevelt from New York state politics. Although Roosevelt was reluctant to accept the nomination for vice president, which he regarded as a relatively trivial and powerless office, his great popularity among most Republican delegates led McKinley to pick him as his new running mate. Quite unexpectedly, Roosevelt would be elevated to the presidency in September 1901, when McKinley was assassinated in Buffalo, New York. After Admiral George Dewey's return from the Spanish–American War, many suggested that he run for president on the Democratic ticket. Dewey, however, had already angered some Protestants by marrying the Catholic Mildred McLean Hazen (the widow of General William Babcock Hazen and daughter of Washington McLean, owner of The Washington Post) in November 1899 and giving her the house that the nation had given him following the war. His candidacy was also almost immediately plagued by a number of public relations gaffes. Newspapers started attacking him as naïve after he was quoted as saying the job of president would be easy, since the chief executive was merely following orders in executing the laws enacted by Congress, and that he would "execute the laws of Congress as faithfully as I have always executed the orders of my superiors." Shortly thereafter, he admitted never having voted in a presidential election before, mentioning that the only man he ever would have voted for, had he voted, would have been Grover Cleveland. He drew even more criticism when he offhandedly (and prophetically) told a newspaper reporter that, "Our next war will be with Germany." Dewey's campaign was met with a level of pessimism by Gold Democrats on whose support his campaign depended. Some even threw their support to Bryan, since they believed him to be the stronger candidate. As early as three days into his candidacy, his campaign having been damaged by the aforementioned missteps, rumors abounded regarding Dewey's impending withdrawal which proved false. Further injuries, however, were made when it became clear that the Democratic Party leaders of Vermont were hostile to Dewey and wholly committed to Bryan. Ohio similarly went for Bryan, though with the caveat there that some leaders suggested that all mention to silver in the party platform be dropped. By May 5, John Roll McLean, the brother-in-law of and effective campaign manager for Dewey, defected from the campaign and was widely considered to now be silently supporting Bryan. By May 17, Dewey recognized that there was very little chance for him to gather enough delegates among the Western and Southern states to possibly keep Bryan from attaining two-thirds of the delegates at the convention, publicly commenting that he no longer even knew why he had decided to run for president at all; He effectively withdrew around this time. After this there was a major boom for his nomination as vice president on the ticket alongside Bryan; however Dewey resolutely refused to be considered. 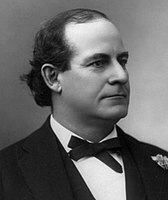 William Jennings Bryan was faced with little real opposition after Dewey withdrew from the race. 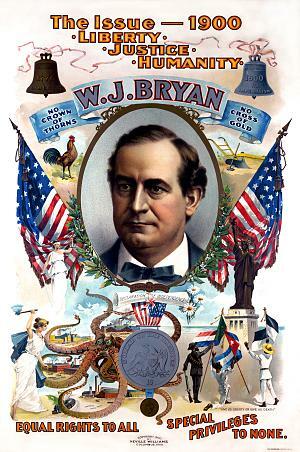 Bryan won at the 1900 Democratic National Convention held at Kansas City, Missouri, on July 4–6, garnering 936 delegate votes for the nomination. Source: US President – D Convention. Our Campaigns. (March 10, 2011). 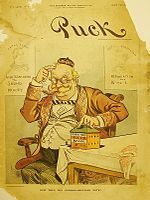 As the nation's third largest party, the Populists had made an organizational decision in 1896 to "fuse" with the Democratic Party on the national level - their identity kept separate by the nomination of two different candidates for vice-president. At the state level, local Populist parties were left at liberty to proceed as they saw fit. In the Plains states, the Populists fused with the Democrats, and in some states replaced them entirely. In the South, the Populists fused with the Republican Party. The end result, though Bryan was defeated, was that the Populists greatly enlarged their representation in Congress, from 10 to 26. In several southern states, however, the legislatures were still controlled by the Democrats, and they began passing a series of laws to eliminate the franchise for black voters, with the intention of undermining a significant bloc of the Populist vote. The move had its intended consequences, as in the mid-term election of 1898, Populist representation in the House of Representatives fell to 9, its lowest since the party's founding. The treatment of Populists by the Democratic Party led to a division in the party. On May 17, 1899, Populist Party leaders met in St. Louis and issued an address calling for a "Middle of the Road" policy, in which the party would decline future fusion efforts. The statement was primarily aimed at the party's national chairman, U.S. Senator Marion Butler of North Carolina, who had been elected to the Senate through fusion with North Carolina Republicans, and was already working for the re-nomination of William J. Bryan by the Populists in 1900. The pro-fusion leaders of the Populists fought back in early 1900. The first state party known to have split was the Nebraska party, which divided during its state convention on March 19. Both factions appointed delegates to the national convention, scheduled for Cincinnati. Ultimately, the Fusion Populists decided to hold a separate national convention when it became apparent that the Ohio Populists did not favor fusion, and were working to organize a convention which would not nominate Bryan, but an independent ticket. The "Fusion" Populist National Convention assembled in a large tent just west of Sioux Falls, South Dakota, on May 9, and unanimously nominated Bryan for the presidency. Charles Towne, the leader of the Silver Republican Party, was near unanimously nominated as his running mate, facing only weak opposition from Representative John Lentz from Ohio. When Adlai Stevenson won the Democratic vice-presidential nomination over Towne, Towne withdrew from the race, with the Fusion Populists endorsing Stevenson. Meeting in Cincinnati, Ohio, the "Middle of the Road" faction adopted a platform that called for the creation of fiat money, government ownership of key industries, and the opening of conservation lands for economic development. Wharton Barker would be nominated for the presidency, while Ignatius Donnelly would be chosen as his running mate. The election of 1900 was the first United States election to feature a socialist candidate. The Socialist Labor Party of America found itself divided over the trade union policy as adopted at the 1896 National Convention, and by the brutal manner in which the party regulars maintained their influence. Many would leave and join with the fast-growing Social Democratic Party of America. At their party convention in Indianapolis, Indiana, Eugene V. Debs was nominated unanimously as the Social Democratic candidate for the Presidency, the first of his five runs, with California lawyer Job Harriman nominated as his running mate. The Prohibition Party met in Chicago, Illinois on June 28 to nominate their presidential ticket. 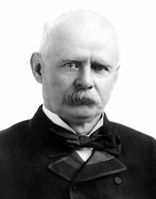 Hale Johnson, who had been their vice-presidential nominee in 1896, withdrew his name immediately before the balloting was to begin. John G. Woolley was nominated on the first ballot, with Henry B. Metcalf of Rhode Island nominated to be his running mate in short order. The American Anti-Imperialist League opposed the annexation of the Philippines. It hoped to nominate a candidate who would run solely on the issue of anti-imperialism. However, the one candidate who had shown any promise, the elderly former Senator John Henderson of Missouri, refused. The Anti-Imperialist Party National Convention on August 15 divided over whether to nominate Bryan or introduce a third ticket. After a motion to nominate an independent ticket failed, Bryan and Stevenson were declared the nominees. The National Party held its second (and last) national convention in the Carnegie Lyceum in New York City, with around 100 delegates present. The convention nominated Senator Donelson Caffery of Louisiana for president and Archibald M. Howe, an attorney from Boston, Massachusetts, for vice president. However Caffery, being a staunch Democrat, refused the nomination, and Howe removed himself soon after. Edward Waldo Emerson was hurriedly nominated in Donelson's place, but would only appear on the ballot in his native Massachusetts. The Union Reform Party nominated Seth H. Ellis of Ohio for president and Samuel T. Nicholson for vice president. The United Christian Party nominated Jonah F. R. Leonard for president, and David H. Martin for vice president. Initially, the party had nominated Silas C. Swallow for president and John G. Woolley for vice president, but both men refused, choosing instead to contest the Prohibition Party nomination (of which Woolley would emerge the victor). Four years ago the nation was uneasy because at our very doors an American island was writhing in hideous agony under a worse than medieval despotism. We had our Armenia at our threshold. The situation in Cuba had become such that we could no longer stand quiet and retain one shred of self-respect.... We drew the sword and waged the most righteous and brilliantly successful foreign war that this generation has seen. Bryan's campaign was built around a reprise of his major issue from the 1896 campaign: Free Silver. It was not as successful in 1900, because prosperity had replaced severe depression and McKinley claimed credit. Advocates of enlarging the money supply to raise prices had to admit that a great deal of new gold was flowing into the world economy, and deflation (i.e. falling prices) was no longer a threat. Bryan's second major campaign theme attacked McKinley's imperialism; Bryan had supported the war, but opposed the annexation of the Philippines. 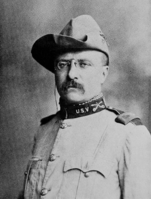 He said McKinley had simply replaced a cruel Spanish tyranny with a cruel American one. Bryan was especially harsh in his criticisms of the American military effort to suppress a bloody rebellion by Filipino guerillas. 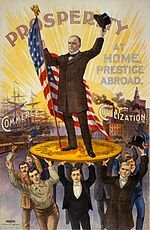 This theme won over some previous opponents, especially "hard money" Germans, former Gold Democrats, and anti-imperialists such as Andrew Carnegie. Both candidates repeated their 1896 campaign techniques, with McKinley campaigning again from the front porch of his home in Canton, Ohio. At the peak of the campaign, he greeted sixteen delegations and 30,000 cheering supporters in one day. Meanwhile, Bryan took to the rails again, traveling 18,000 miles to hundreds of rallies across the Midwest and East. This time, he was matched by Theodore Roosevelt, who campaigned just as energetically in 24 states, covering 21,000 miles by train. The German-American vote in 1900 was in doubt since they opposed both Bryan's "repudiation" policy and overseas "expansion" under McKinley. The triumph of the American army and navy in the war against Spain was a decisive factor in building Republican support. Democrats tried to argue that the war was not over because of the insurgency in the Philippines; this became their major issue. A perception that the Philippine–American War was coming to an end would be an electoral asset for the Republicans, and the McKinley administration stated that there were reductions of troops there. Republicans pledged that the fighting in the Philippines would die down of its own accord within sixty days of McKinley's re-election. However, as one lieutenant explained in a letter to his wife, "It looks good on paper, but there really has been no reduction of the force here. These battalions [being sent home] are made up on men...about to be discharged." The success of this unique system of war depends upon almost complete unity of action of the entire native population. That such unity is a fact is too obvious to admit of discussion; how it is brought about and maintained is not so plain. Intimidation has undoubtedly accomplished much to this end, but fear as the only motive is hardly sufficient to account for the united and apparently spontaneous action of several millions of people. One traitor in each town would eventually destroy such a complex organization. It is more probable that the adhesive principle comes from ethological homogeneity, which induces men to respond for a time to the appeals of consanguineous leadership even when such action is opposed to their interests and convictions of expediency. Nonetheless, the majority of soldiers in the Philippines did not support Bryan. Any mention of the election of 1900 in the soldiers' letters and diaries indicated overwhelming support for the Republican ticket of McKinley and Roosevelt. According to Sergeant Beverly Daley, even the "howling Democrats" favored McKinley. Private Hambleton wrote, "Of course, there are some boys who think Bryan is the whole cheese, but they don't say too much." Despite Bryan's energetic efforts, the renewed prosperity under McKinley, combined with the public's approval of the Spanish–American War, allowed McKinley to gain a comfortable victory. Results by county explicitly indicating the percentage for the winning candidate. Shades of red are for McKinley (Republican), shades of blue are for Bryan (Democratic), and shades of green are for "Other(s)" (Non-Democratic/Non-Republican). It is a matter of considerable importance that Theodore Roosevelt, the vice-presidential candidate on the Republican ticket, attracted unusual attention in the campaign, and it has been commonly asserted that he brought a considerable number of votes to the Republican ticket. McKinley polled roughly 7,200,000 votes. He carried 28 states with a combined 292 electoral votes (65.32%). He slightly increased his national percentage (51.60%) with 120,000 more votes than in 1896. This change is reflected in the gains made in number of counties carried; McKinley had 222 more counties than he had carried in 1896, thus gaining a slight majority of the total number of counties making returns in 1900. Of the 2,729 counties making returns, McKinley won in 1,385 (50.75%) while Bryan carried 1,340 (49.10%). Two counties (0.07%) were split evenly between McKinley and Bryan, while two counties (0.07%) in Texas recorded more votes cast for "Other(s)" than either of the two-party candidates. McKinley had a majority in 1,288 counties while Bryan had a majority in 1,253 counties. Further examination reveals that changes in counties were even more impressive. Of the 2,729 counties making returns, 2,286 were identical in these two elections; 113 changed from Republican to Democratic; and 328 changed from Democratic to Republican. A notable feature was the Bryan gains made in the New England and (Northeastern) Mid-Atlantic sections, with also a slight gain in the East North Central section. Bryan even managed to win New York City by almost 30,000 votes when he had lost it by more than 60,000 votes just 4 years earlier. In all other sections, Bryan's vote was less than in 1896, and in the nation his total vote was 23,000 less than in 1896. The percentage of total was 45.52, a slight loss. Kentucky, which he carried this time, showed an increase of 17,005. In 16 states, the Democratic vote increased, but in 29 states it was less than in 1896. Bryan carried only 17 states. This was the last election in which the Republicans won the majority of electoral votes in Maryland until 1920 and the last in which the Democrats won Idaho, Missouri, and Montana until 1912. It is also the last election in which a Republican won the presidency without winning Idaho and Montana. Source (popular vote): Leip, David. "1900 Presidential Election Results". Dave Leip's Atlas of U.S. Presidential Elections. Retrieved July 28, 2005. ^ "ADMIRAL DEWEY LOSES HOPE; Says Now Doesn't Know What Prompted Him to Aspire to the Presidency" (PDF). The New York Times. May 18, 1900. ^ "A KENTUCKY VIEW OF DEWEY. - Ex-Gold Democratic Leader Says Admiral Has No Chance. - View Article - NYTimes.com" (PDF). query.nytimes.com. Retrieved May 24, 2014. ^ "DEWEY HAS NO SHOW, KYLE SAYS. - South Dakota Senator Thinks Gold Democrats Are for Bryan. - View Article - NYTimes.com" (PDF). query.nytimes.com. Retrieved May 24, 2014. ^ "DEWEY SAYS HE WILL NOT WITHDRAW - The Admiral Denies that He Has Any Intention of Quitting. SOME OTHER DEWEY RUMORS A New Story Is that He Will Not Oppose Chicago Platform -- Avoiding Visitors. - View Article - NYTimes.com" (PDF). query.nytimes.com. Retrieved May 24, 2014. ^ "DEWEY'S STATE AGAINST HIM. - Vermont's Eight Votes at Kansas City to Go for Bryan. - View Article - NYTimes.com" (PDF). query.nytimes.com. Retrieved May 24, 2014. ^ "Ohio Democrats for Bryan. - View Article - NYTimes.com" (PDF). query.nytimes.com. Retrieved May 24, 2014. ^ "McLEAN DESERTS DEWEY? - Stated Positively in Columbus that the Admiral's Candidacy Is to be Gradually Abandoned. - View Article - NYTimes.com" (PDF). query.nytimes.com. Retrieved May 24, 2014. ^ "ADMIRAL DEWEY LOSES HOPE. - Says Now He Doesn't Know What Prompted Him to Aspire to the Presidency. - View Article - NYTimes.com" (PDF). query.nytimes.com. Retrieved May 24, 2014. ^ a b "DEWEY FOR VICE PRESIDENT. - Democrats May Avail Themselves of His Popularity in the Middle West. - View Article - NYTimes.com" (PDF). query.nytimes.com. Retrieved May 24, 2014. ^ a b c "DEWEY BOOM GROWS. - Democrats Favor His Candidacy for Vice President -- Other Names Proposed. - View Article - NYTimes.com" (PDF). query.nytimes.com. Retrieved May 24, 2014. ^ a b "DEWEY NOT A CANDIDATE. - He Would Not Accept a Nomination for Vice President. - View Article - NYTimes.com" (PDF). query.nytimes.com. Retrieved May 24, 2014. ^ "Election of 1900 Overview". HarpWeek. Retrieved 2018-12-29. ^ Schlup, Leonard (1986). "In the Shadow of Bryan: Adlai E Stevenson and the Resurgence of Conservatism at the 1900 Convention" (PDF). Nebraska History. 67: 223, 230. ^ "REVOLT AGAINST SILVER MAY DEFEAT TOWNE - Adlai E. Stevenson Enters the Field for Vice President. A BAD SITUATION FOR BRYAN Whatever Choice Is Made Is Likely to be Unsatisfactory to Large Part of Convention. - View Article - NYTimes.com" (PDF). query.nytimes.com. Retrieved May 24, 2014. ^ "VICE PRESIDENTIAL CANDIDATE. - View Article - NYTimes.com" (PDF). query.nytimes.com. Retrieved May 24, 2014. ^ "Danforth for Vice President. - View Article - NYTimes.com" (PDF). query.nytimes.com. Retrieved May 24, 2014. ^ "CROKER ON THE GROUND. - New Yorkers Arrive at Kansas City -- Intimate that Tammany. May Not Fight Hill's Nomination. - View Article - NYTimes.com" (PDF). query.nytimes.com. Retrieved May 24, 2014. ^ "SULZER FOR VICE PRESIDENT. - New Yorker Is Termed "the Probable Candidate" with Bryan. - View Article - NYTimes.com" (PDF). query.nytimes.com. Retrieved May 24, 2014. ^ "SULZER CONSULTS BRYAN. - Says He Is Not Seeking the Vice Presidency -- His Highest Ambition to See Bryan President. - View Article - NYTimes.com" (PDF). query.nytimes.com. Retrieved May 24, 2014. ^ "HOUSE DEMOCRATS DIVIDED - Differences Accentuated in the Deficiency Bill Debate. MR. SIBLEY DEFENDS MR. GAGE Congressman Driggs Resents an Imputation Cast Upon His Democracy -- Cannon Pokes Fun at Sulzer. - View Article - NYTimes.com" (PDF). query.nytimes.com. Retrieved May 24, 2014. ^ "THE INDIANA CONVENTION. - Platform Question Almost Lost Sight of in Excitement Over Democratic Gubernatorial Nomination. - View Article - NYTimes.com" (PDF). query.nytimes.com. Retrieved May 24, 2014. ^ "KANSAS POPULISTS FOR BRYAN. - Twenty County Conventions Favor Him and ex.Gov. Pattison. - View Article - NYTimes.com" (PDF). query.nytimes.com. Retrieved May 24, 2014. ^ "WILLIAMS FOR VICE PRESIDENT. - Populists Plan to Link His Same with Bryan's. - View Article - NYTimes.com" (PDF). query.nytimes.com. Retrieved May 24, 2014. ^ "GEORGE FRED WILLIAMS TALKS - Denounces Hill and Cleveland, and Discusses the Platform. - View Article - NYTimes.com" (PDF). query.nytimes.com. Retrieved May 24, 2014. ^ "ALTGELD AGAINST PATTISON. - Ex-Governor Says Candidate Must Be the Counterpart of the Head of the Ticket. - View Article - NYTimes.com" (PDF). query.nytimes.com. Retrieved May 24, 2014. ^ "THE KANSAS CITY PLATFORM. - View Article - NYTimes.com" (PDF). query.nytimes.com. Retrieved May 24, 2014. ^ "CARTER HARRISON TO BE BOOMED. - View Article - NYTimes.com" (PDF). query.nytimes.com. Retrieved May 24, 2014. ^ "HILL HUMILIATED BY RICHARD CROKEER - Scene of Great Excitement in New York Delegation. ANGRY CHARGESON BOTH SIDES Fight Likely to Result in a Split in the Democratic Party. Van Wyck Given the Place on Platform Committee -- Delegation to Support Keller for Vice President. HILL HUMILIATED BY RICHARD CROKER - View Article - NYTimes.com" (PDF). query.nytimes.com. Retrieved May 24, 2014. ^ "BRYAN'S RUNNING MATE TALKS. - Mr. Towne Says His Name Will Be Submitted to Kansas City Convention. - View Article - NYTimes.com" (PDF). query.nytimes.com. Retrieved May 24, 2014. ^ "HILL FOR VICE PRESIDENT - His Nomination Is Regarded as Not Improbable. Should Republicans Select a New York Man the Democrats Would Be More Likely to Name Mr. Hill. - View Article - NYTimes.com" (PDF). query.nytimes.com. Retrieved May 24, 2014. ^ "PREFERENCES OF DELEGATES. - Most of Them Want a Money Plank That Will Avoid a Declaration in Favor of Silver at 16 to 1. - View Article - NYTimes.com" (PDF). query.nytimes.com. Retrieved May 24, 2014. ^ a b "BOSTONIANS INVITE BRYAN. - Bryan Club of Massachusetts Asks Him to Breakfast Jan. 30. - View Article - NYTimes.com" (PDF). query.nytimes.com. Retrieved May 24, 2014. ^ "BRYAN AND ATKINSON? - View Article - NYTimes.com" (PDF). query.nytimes.com. Retrieved May 24, 2014. ^ "CALDWELL NOT A CANDIDATE. - Arkansas Judge Does Not Want Vice Presidential Nomination. - View Article - NYTimes.com" (PDF). query.nytimes.com. Retrieved May 24, 2014. ^ "DEWEY GROWS STRONGER - Perry Belmont, Who Is Working for Him, Talks to Congressmen. THE FEELING AGAINST BRYAN Belief that If All Democrats Spoke Out the Admiral's Nomination Would Be Assured. - View Article - NYTimes.com" (PDF). query.nytimes.com. Retrieved May 24, 2014. ^ "LETTER FROM ADMIRAL SCHLEY. - Repeats His Declaration that He Has No Desire for Office. - View Article - NYTimes.com" (PDF). query.nytimes.com. Retrieved May 24, 2014. ^ "Ohioans Favor W.R. Hearst. - View Article - NYTimes.com" (PDF). query.nytimes.com. Retrieved May 24, 2014. ^ "COL. CODY FOR VICE PRESIDENT. - D.J. Campan Says He Would Be as Picturesque as Roosevelt. - View Article - NYTimes.com" (PDF). query.nytimes.com. Retrieved May 24, 2014. ^ "FOR HILL OR TOWNE - ANTI OR PRO SILVER - Contest for Vice Presidential Nomination Narrows. SHIVELY RETIRES FROM FIELD Sulzer's Boom Is Regarded as Dead or Dying -- Hill Will Not Run on a 16 to 1 Platform - Towne Will. - View Article - NYTimes.com" (PDF). query.nytimes.com. Retrieved May 24, 2014. ^ John M. Hilpert, American Cyclone: Theodore Roosevelt and His 1900 Whistle-Stop Campaign (U Press of Mississippi, 2015). ^ "1900 Presidential General Election Data - National". Retrieved March 18, 2013. Bailey, John W., Jr. (1973). "The Presidential Election of 1900 in Nebraska: McKinley over Bryan". Nebraska History. 54 (4): 561–584. ISSN 0028-1859. Bailey, Thomas A. (1937). "Was the Presidential Election of 1900 a Mandate on Imperialism?". Mississippi Valley Historical Review. 24 (1): 43–52. doi:10.2307/1891336. JSTOR 1891336. Coletta, Paolo E. (1964). William Jennings Bryan. 1. Lincoln: University of Nebraska Press. ISBN 0-8032-4050-3. Gould, Lewis L. (1980). The Presidency of William McKinley. Lawrence: Regents Press of Kansas. ISBN 0-7006-0206-2. Harrington, Fred H. (1935). "The Anti-Imperialist Movement in the United States, 1898–1900". Mississippi Valley Historical Review. 22 (2): 211–230. doi:10.2307/1898467. JSTOR 1898467. Hilpert, John M. (2015) American Cyclone: Theodore Roosevelt and His 1900 Whistle-Stop Campaign (U Press of Mississippi, 2015). xii, 349 pp. Kent, Noel Jacob (2000). America in 1900. Armonk, NY: M.E. Sharpe. ISBN 0-7656-0595-3. Miller, Stuart Creighton (1982). Benevolent Assimilation: The American Conquest of the Philippines, 1899–1903. New Haven: Yale University Press. ISBN 0-300-03081-9. Morgan, H. Wayne (1963). William McKinley and His America. Syracuse: Syracuse University Press. ISBN 0-87338-765-1. Morgan, H. Wayne (1966). "William McKinley as a Political Leader". Review of Politics. 28 (4): 417–432. doi:10.1017/S0034670500013188. JSTOR 1405280. Schlup, Leonard (1986). "In the Shadow of Bryan: Adlai E. Stevenson and the Resurgence of Conservatism at the 1900 Convention". Nebraska History. 67 (3): 224–238. ISSN 0028-1859. Schlup, Leonard (1991). "The American Chameleon: Adlai E. Stevenson and the Quest for the Vice Presidency in Gilded Age Politics". Presidential Studies Quarterly. 21 (3): 511–529. ISSN 0360-4918. Tompkins, E. Berkeley (1967). "Scilla and Charybdis: the Anti-imperialist Dilemma in the Election of 1900". Pacific Historical Review. 36 (2): 143–161. ISSN 0030-8684. JSTOR 3636719. Wikimedia Commons has media related to United States presidential election, 1900.